So what to do with the “in-between” days — not too hot, not cold. Just crisp or cool or damp? There is an easy and elegant solution to not having to lug around your overcoat on days when the temperature is erratic…. get yourself a good scarf and learn a couple of ways to tie it. At an end of the season sale last year, I lucked into a gold and brown glen plaid wool that reverses into a silk with multi-colored little boxes sprinkled around the gold background. I feel particularly sharp wearing it with my grey suits and brown suede shoes. One last thing, whatever material you opt for (I also have a new red cotton jersey scarf from American Apparel to be used for bicycling like the art director in the shot above)– buy a long one. Or check out the $13 faux pashminas at Target. The price is right. But remember, go long — they’re just easier to tie and look better when you’re wearing casual clothing. 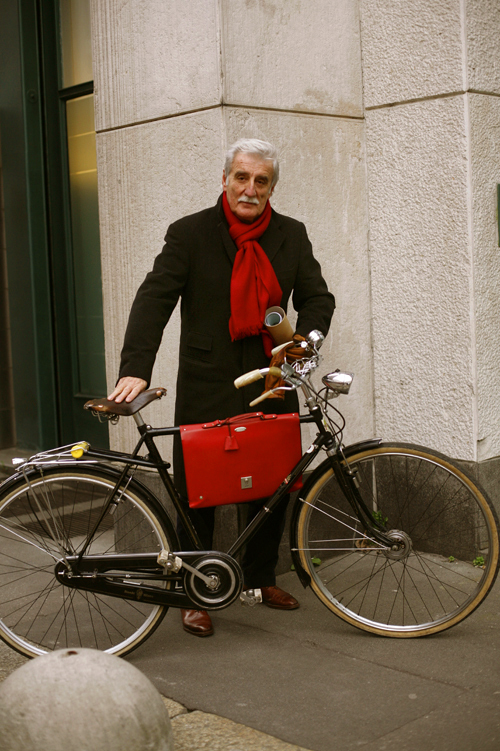 This entry was posted in Elegantology, Living and tagged bicycles, casual clothing, elegantlology, leisure, Living, scarves, weekend. Bookmark the permalink. HAHAHA!!! I have a lot of real pashminas, but just got a faux one in black at target for a wrap at the office… if you’ve seen the pix on my blog, you might be correct in thinking that it’s a drafty old building with radiator heat! Ah, sounds just like home… . Except for the radiator heat – ours was removed during the most recent renovation. I miss putting the pot of water on top to keep the humidity at comfortable levels!